Want to say a huge thank you to Tony-manda Telford for all the support they gave me during my driving experience, I passed my driving test today and I wouldn't have done it without them! highly recommended!! theory Stuart Summers Done my Theory Test the other day it was made well easy by studying on Tony's free website. Just a brief few words to recommend Tony as exceptionally good instructor. I was struggling with the driving learning process with a previous instructor, and finally decided to switch, which was the one of the best things I have ever done. Tony has a genuine passion for teaching and driving - and this shines through. Within weeks of ......starting lessons with him, I was making strong progress... and now, only a couple of months later, my confidence is soaring - to the extent that I drove 300 miles when on a weeks holiday (My wife in the passenger seat!). I take my test in 5 weeks time and I am actually looking forward it! I am so thankful to Tony for his highly professional, attentive, skillful, good natured and supportive approach. He is an excellent communicator too, and explains things very clearly - Cheers Tony! If anyone is considering choosing Tony as their instructor I would say definitely go for it! I passed my test first time a couple of weeks ago... and I owe a huge debt of gratitude to Tony. I am quite a nervous person... and I was not making very good progress with my previous (first) instructor...... Luckily Tony was the next instructor I decided to choose, and I never looked back! Not only is To...ny a genuinely nice person, he is also an excellent instructor and great communicator... He somehow manages to be supportive and firmly motivational at the same time... firmly pushing the pupil fully realises their driving potential (but in a friendly way!) - It is an insightful and highly professional approach - and one that gradually helped me to build up loads of confidence! It's two weeks since I passed my test, and I am driving alone to and from work 22 miles a day. Cheers Tony for giving me such a strong foundation of skills to take my driving forward! Thoroughly recommended! Leo Saunders 01440710437 Melanie Jane Saunders I would recommend Tony to everyone, a very kind and patient instructor. Leo passed first time, very proud!! 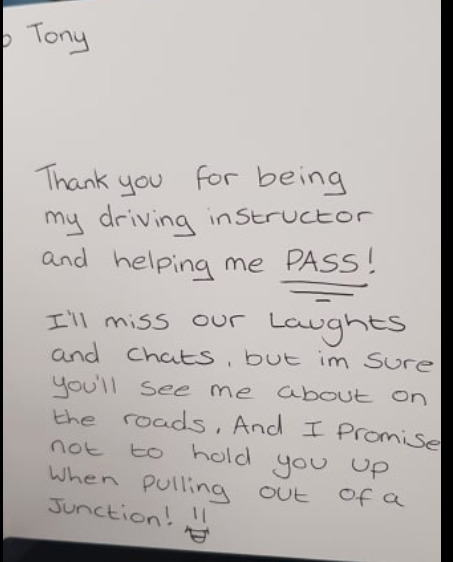 I have been with previous driving instructors before but I haven't felt like I was fully comfortable with them, but recently I have started up lessons with you and in all honesty I believe my driving, confidence behind the wheel and general feeling whilst being in the car has come along way and I finally feel like I am ready to go forward and pass my test. Your teaching methods which you have in place are not only very clear and understandable but you also teach in a way which puts you at ease, which being a learner driver, they can sometimes become overwhelming. I am convinced my driving has improved dramatically and I believe this is down to your friendly, encouraging attitude whilst being out on a lesson. I would fully recommend any of my friends or family that if they are looking for a driving instructor with patience, good teaching skills and who is very friendly to get in contact with you because you are more than reasonably priced and brilliant at your job! I am looking forward to carrying on my lessons with you.